Who are the nurses and who are the manufacturers? I've beenÂ following this Forum forÂ over aÂ year.Â I have gleaned much valuable information.Â I want to improve my practice and I value the contributions of allÂ the wonderful nurses who areÂ out there everyday, taking care of patients. I see many postings from people who are not nurses (the kind thatÂ work at the beside actually practicing),Â but work for manufacturers.Â One in particular seems toÂ PUSH VERYÂ HARD to drive practice for the benefit of the company she works for.Â To the point of rudeness and bullying.Â Is this ethical?Â And why does her company condone this?Â I guess it's because it sells catheters. To this manufacturers rep, I thank you for yourÂ opinion that a taper doesn't cause any complications in the vessel.Â Â Are there official parameters for taper vs larger catheter? Â Do you believe that a silent thrombus is not a problem?Â You didn't believe it before your company came out with the large tapered catheter.Â What has happened toÂ make you change your mind? I would very much like to hear less from manufacturers on this site and more fromÂ practicing clinicians.Â Â I believe they can offer insight to the particulars of their product, I don't think it's safe for them to address practice issues.Â I wondered if anyone else shared the same concerns. This site is definitely not owned by Bard! It is owned by Sarah, an IV nurse from Oregon Health Sciences University. Sorry Sarah, don't recall how to spell your last name. I do agree that many postings, especially those from manufacturers employees (clinical and sales) can be too far to the sales and marketing side and very light on sound clinical information. But since it is a forum open to anyone wishing to join, I am not sure that Sarah has a mechanism for policing this. Also, please do not rapidly discount something just because it is coming from a manufacturer's representative. Many of them have a large amount of knowledge about their products and that is what we need. I would agree though, that the clinical application of that product information is in the hands of nurses to decide. Lynn, this was not by any means directed at you. I don't rapidly discount what they say. My issue is that they seem to come out with a product then hammer the nurses about all the benefits whether they are real or not. It seems too many nurses are willing to make changes on percieved problems. The perception, too many times, comes from the manufacturer. One issue is the role of a catheter taper. Is it really to tamponade the site? If it were, then why does it have to be so huge? I was told that the taper would dwell in the subcutaneous tract. Who are they kidding? Probably many people. I would value a taper that was maybe half a french size and only 1 cm. 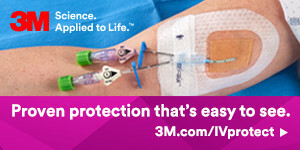 This would actually keep my site from bleeding and not decrease the flow around the catheter. Is that not possible? That's just one of the concerns I have about what a manufacturer's rep will say to a nurse and amazingly it becomes reality. I've never placed a catheter as deep as the taper is long. I appreciate the fact that this Forum is not owned by a manufacturer but by an individual. I wonder if other manufacturers read (or post?) to find out what we need to better serve our patients. That's my bottom line. You have some valid concerns. I am also amazed when nurses repeat something from a manufacturer's rep without seeing it in writing. FDA labeling requirements considers anything that is said by a company employee to be labeling. So it is imperative that they do not go beyond the boundaries of what the company has put in writing. However, in the effort to get sales, many do push or break that boundary. Many companies have severe restrictions about their employees posting information on sites such as this because it would be considered labeling. So always get it in writing. About product features, let the company know how you feel about it. Regarding reverse tapers, I think that came about because of feedback from IR. But you know that a physician will request different features than a nurse. I can think of many product features that have began as an idea from the clinical side, then became a strong marketing tool for the company, although the outcomes were not available to support the feature. Your best approach is good communication with the manufacturers. They do listen to you. This comment is in response to Jackie's question: I wonder if other manufacturers read (or post?) to find out what we need to better serve our patients. That's my bottom line. I have kept up with this site for over 2 years. I think it is incredibly valuable in assisting me to understand what issues nurses have with infusion therapy. I have never commented before because my role is simply to answer questions about specific products. I am sure I have many peers that use this site for the same purpose of education, not promotion. I hope that helps to answer your question. Thank you for your candor and honesty. The goal of this site is to promote better practice and give support to the nurse at the bedside and I think this site for the most part does that so thank you to all who contribute. Your comments serve as a caution for those of us that work in mfg to choose our words carefully in order to best serve our nursing peers. I am a nurse that works for a manufacturer and I love my job because I get to visit and network with nurses like yourself to better move the practice of IV therapy forward. I want you to know that it is vital for nurses at the bedside to gather data and support nursing research. I was a bedside nurse in vascular access for many years and practices will continue to evolve based on your input and the research of others as long as it is published and shared. The thrombosis rate was zero and 473 catheters were followed for the entire hospital stay. There were only 422 catheters that they removed and have full data on. All catheters were 6 French with reverse taper (double and triple lumens). The thrombosis rate reported was zero and that is symptomatic of course so who knows what the rate of non-symptomatic is as no doppler studies were done. The median dwell time ws 7.93 days but remember these patients are hospitalized and that is the mean with a range of 1 to 45 days. Most studies do indicate that the majority of thrombosis occur within 14 days believe it or not. Now the author did have two catheters that leaked at the insertion site and one can suspect that this is an undiagnosed thrombosis so that would make the rate of thrombosis 2/422 which is way less than 1%. I suggest contacting both of these authors as their e-mail addresses are at the bottom of their articles and I am sure they will be happy to discuss their measuring technique of vein versus catheter size. As a matter of fact I belive Inez Nichols will be presenting at AVA this year on her research findings.